The popular ROM Wildlife Photographer of the Year Contest gives both amateur and professional photographers the chance to win an Explore Borneo adventure tour for two. 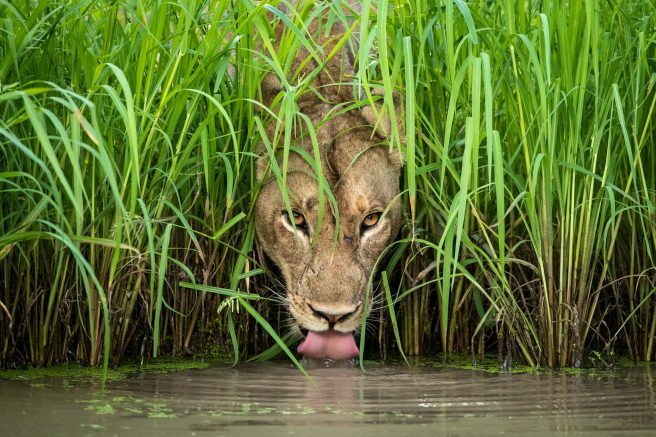 The world-renowned Wildlife Photographer of the Year exhibition returns to the Royal Ontario Museum (ROM) in nearby Toronto on Saturday, Dec. 1. Featuring 100 original images, Wildlife Photographer of the Year showcases the world’s best nature photography, from fascinating animal behavior to breathtaking landscapes. New this year and unique to the ROM’s presentation is an interactive coral reef installation that immerses the public in the undersea world of this vital ecosystem. Inspired by a photo in the exhibition’s Underwater category, the ROM’s exploration of a coral reef invites visitors to learn about the diversity and sustainability of life on a reef. The display highlights the human impact on these ecosystems while inspiring change, with visitors participating in rebuilding a reef as part of this immersive experience. “The ROM has long been at the forefront of international study about coral reefs and their inhabitants. This includes the 125 species of coral reef fishes completely new to science, and four new species described in 2018. Scientists from around the world continue to study the ROM’s coral collection,” says Sebastian Kvist, Associate Curator, Natural History, ROM. The underwater exploring continues on Tuesday, Dec. 4, when National Geographic photojournalist Brian Skerry delivers the Wildlife Photographer of the Year keynote lecture Luminous Seas. Known for his photographs of undersea wildlife and environments, Skerry’s visual storytelling highlights the problems facing the world’s oceans. This year, the Wildlife Photographer of the Year exhibition also features four Highly Commended entries from three notable Canadian photographers: award-winning National Geographic photographer Shane Gross from Regina, SK, and photographers Liron Gertsman and Jess Findlay from Vancouver, BC. The popular ROM Wildlife Photographer of the Year Contest gives both amateur and professional photographers the chance to win an Explore Borneo adventure tour for two, courtesy of G Adventures, and have their photo on display at the ROM. The contest invites participants to share their own nature photography on social media and tag #ROMWPYON. For more details, visit rom.on.ca/contest. Wildlife Photographer of the Year is a separately ticketed exhibition that will be on display in the ROM’s Third Floor Centre Block until March 30, 2019. ROM members enjoy free admission and exclusive previews of the exhibition. For more information on ROM Membership, visit rom.on.ca/members. Be the first to comment on "Wildlife Photographer of the Year exhibition opens at the ROM on December 1"